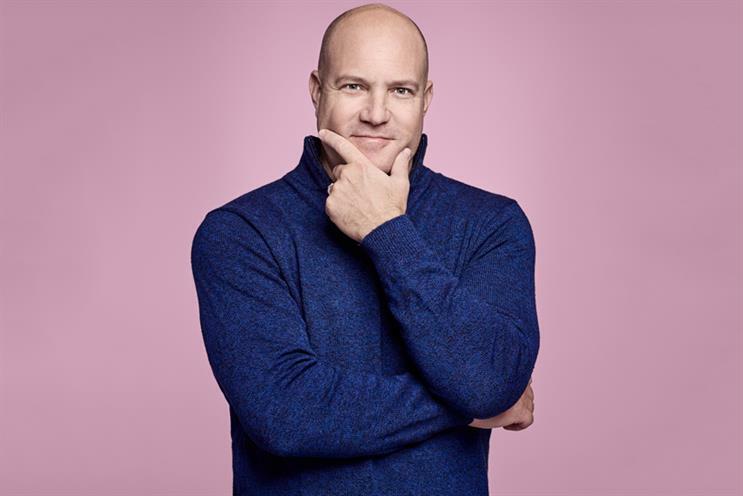 Scott Hagedorn, founder of the Omnicom shop, believes media agencies need to act as the conductor to orchestrate the complex relationship between creative, data, CRM and technology. Scott Hagedorn comes from a family of inventors and entrepreneurs. His LinkedIn page is illustrated with a design of one of his grand- father’s patents from 1947, a bedcover clamp to hold a mattress in place. His father’s claim to fame is that, as a banker, he helped to fund the original World Wrestling Foundation. The younger Hagedorn already looks to have secured his place in advertising history as the man who invented Hearts & Science, a new breed of media agency fit for a digital world of data-driven marketing and personalisation. His agency has had a dream start, winning $6bn of business, including Procter & Gamble as its first client in the US in December 2015 and AT&T in August 2016. These brands have bought into Hagedorn’s belief that customer relationship management skills are now the key to making media work. "We live in an era where CRM as a practice has collided with addressable media," he explains. "We need to bring a CRM-oriented mindset into the media space." The Omnicom shop suffered a setback this spring when it failed to win any of P&G’s business in a review across northern Europe, including the UK, but it is still the envy of most other big media agencies. Arguably its success has prompted WPP to merge MEC, which lost AT&T, with Maxus and to try to turn digital agency Essence into a rival to Hearts & Science. The past 18 months have been "great and kinda hectic," Hagedorn says, fresh from winning two golds in the Media Lions at Cannes for "Bradshaw Super Bowl stain" for P&G’s Tide. It is not just building a new agency from scratch and hiring 800 people that have been hectic. Hagedorn thinks the media business is going through the biggest change in 15 years, since digital advertising first went mainstream. "It’s changing seismically," he declares. The global media agencies of the past decade have been built on planning and buying services. He says they now need to focus more broadly on services and technology infrastructure and "the orchestration" of those complex parts. Orchestration matters because most marketers now have their own data management platform (DMP), need their systems to plug into the rest of the digital media supply chain and want dynamic creative that can be personalised and distributed at scale, he says. If Hagedorn’s rivals are playing catch-up, it’s because he says he "spent five years conceiving the idea" of his agency before winning P&G. He founded Annalect, Omnicom Media Group’s data business, in 2010 and while running it he began to realise the compelling logic of bringing data and media together at speed and scale with tech smarts. "Hearts & Science is a weaponised version of Annalect," Hagedorn says. "We took everything we’d built and then focused it specifically on P&G." Even his early career looks like it was a preparation for Hearts & Science. When he did his degree at the University of Florida in the early 1990s, Hagedorn majored in advertising and his minors were in anthropology and computer science. His agency now sits at the nexus of those three interests. • inquisitiveness in interrogating data and the broader digital ecosystem. His analysis of how media agencies must evolve is rooted in a belief that clients’ needs have changed. Marketers are taking more control of their technology and data, and agencies should help them do it, Hagedorn says. "Most of the other media agencies have black-box operating systems and we think those are archaic because they can’t adapt to the changing pace of the environment," he explains. "I would say 75% or so of our clients now have their own ad tech stack. You have to be able to adapt how your agency works around your client’s technology investment. If you have an operating system within your agency that is a closed one, you are instantly non- operable with your clients." The role of the orchestrator is now vital in this more complex world, where creative, data, analytics, e-commerce, CRM and media need to be coordinated. But Hagedorn thinks media agencies are not guaranteed to be wielding the baton. "It’s up for grabs," Hagedorn warns, suggesting creative agencies or even consulting firms could also be the orchestrator. However, he thinks talk of consultants entering the sector is more hype than reality, not least because the fees in media are lower than in consulting. As for inquisitiveness, he believes there are still flaws in the digital media supply chain that must be investigated, especially in online video, which he calls a "perfect storm". "We have concerns about how Nielsen tracks video and content consumption," he says. "We think there could be a 40% outage with mobile," meaning that a lot of viewing, particularly by young people who have given up on linear TV, is not being tracked properly. He is impatient about the slow pace of creative change. "We’re still trying to force-fit ‘legacy’ TV into mobile," he says, bemoaning how consumers are forced to view 15- or 30-second ads before the video content they want to watch. "It’s making consumers mad." There’s a "huge opportunity" to do it better, he adds. Hagedorn’s strategic vision, combined with his understanding of the minutiae of digital advertising and data, has impressed clients. Gerry D’Angelo, global media director at P&G, says: "Scott is fairly unique as a media agency chief executive in that he is as comfortable getting into the details as he is offering a strategic perspective." Michael Kassan, chairman of MediaLink, which ran the AT&T pitch, says: "Scott is a maths man who really gets strategy and understands client service. He is also surprisingly self-effacing." Hagedorn ran PHD in the US for two years before founding Annalect, and Mike Cooper, global chief executive of PHD, says his ability to straddle creativity and technology – the art and the science – is a major asset. "He is a guy who understands the technology and the data but, most unusually, he knows how to be a creative thinker in that environment," Cooper says. "He is also very good at getting his team on-side. That’s probably the quality you need most if you’re running one of the global networks." People skills are important because building a new agency requires fresh thinking and talent. Hagedorn had a small team of only "about five or ten" people who worked on the P&G pitch. After that, he staffed up with a 50:50 mix of internal and external recruits. However, the AT&T win meant he had to recruit heavily outside Omnicom. A lot of new hires have come from what he calls "the ad tech community" and, importantly, CRM shops such as Wunderman and Merkle. "We find it easier to train the CRM resources on media than it is to train media resources on CRM," Hagedorn says, explaining why he has brought in talent from outside media agencies. Hearts & Science is headquartered in its own office in New York, rather than with another Omnicom media shop, because Hagedorn felt it was important for the agency’s culture. There is a second New York office, inside sister creative shop BBDO, to handle AT&T. Hearts & Science has also expanded to other US cities and nine more countries, including Mexico, Canada, Japan and the UK. Omnicom announced the launch of Hearts & Science in London, under the leadership of Frances Ralston-Good, last September and the UK agency has kept a low profile as it pinned its hopes on winning P&G. Now Hagedorn and Ralston-Good, who also used to work at PHD, need a new plan. However, Hearts & Science already has a dozen UK clients, including Amazon Prime, Not On The High Street and Yakult. Ralston-Good, sitting alongside Hagedorn, is bullish, saying many of her clients "have been hungry" for help on "this orchestration piece", particularly when it comes to e-commerce. "It’s almost like the market has an unmet need," she says. The history of Hearts & Science might have been different if Omnicom, which wanted a third media network to sit alongside OMD and PHD, hadn’t lost out to WPP in the race to buy Essence in October 2015. But there is a sense that Hagedorn was itching to build his own agency as he recalls how "I put my career on the line" at Annalect by persuading Omnicom to invest $20m in creating its own DMP five years ago. That gave Omnicom a huge pool of audience data for his CRM people to use to this day, he says. Some industry critics wonder if the agency is all it is cracked up to be. "Hearts and Savings" is one unkind nickname – coined because some rivals think pricing is always a factor. Hagedorn admits there have been teething problems with some "executional" problems for clients although the number of mistakes does not run into double figures. Kassan thinks Hearts & Science is a genuine pioneer: "The concept of art and science coming together is an idea that was long overdue. As we say in the entertainment business, Hearts & Science is not a one-trick pony. It has legs." Now Hagedorn must prove he can retain clients and win more new business. He does not mention AT&T’s acquisition of Time Warner but that could be a test. Some agencies have struggled with a client that isn’t the right fit and he admits: "I could see us potentially not going after bricks-and-mortar retail. We have concerns about the sustainability of the business model." As everything turns digital, he thinks online must ask itself hard questions. "No-one has really studied the brand-equity effect of online video," he says. Watching Mad Men "is not the same" as a PewDiePie video on YouTube. With online advertising, "could we be building negative reach?" and making consumers "less likely to buy", he wonders. For Hagedorn, the revolution has only just begun. Favourite ad Gibson Guitars print ad. It was all in the headline: "Because my wife is never going to tell me my drinking is getting better"